It’s amazing what a difference the base colour makes. I have two zebra pieces, both done on Art Spectrum’s Colourfix, a sanded surface. One previously posted which was done on the Terra Cotta colour, and a new one of 19 zebras done on the Storm Blue colour. Both are zebras in Etosha National Park in Namibia. Both were at different times of the day, in fact different days. One had some wind and cloud, the other had no wind and was nice and sunny. I wanted the single zebra to look like it was in a scorched earth, whereas the new one is a cool winter’s day, almost no reflections because of the light wind. The choice of base colour was crucial to get these different effects. 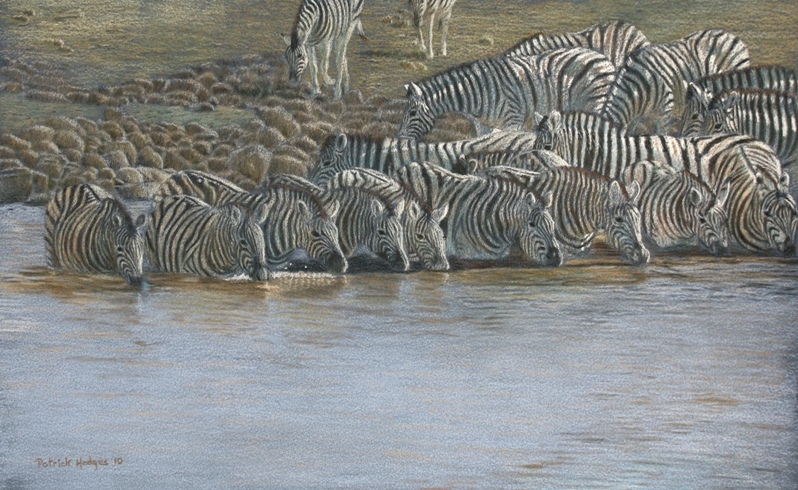 Since I used coloured pencils for the most part (although I used pastels for the sky and water in the single zebra one) the base shows through a lot as the pencils simply can’t cover the sanded surface of the Colourfix as well as pastels can. It sure chews up the pencils too. It’s a great surface for pastels but possibly not as good for coloured pencils, you need to work much harder to get the colours bright. Here’s the new one followed by the one I’ve talked about in an earlier post. Quite a difference! I really enjoyed your website and look forward to being among the lucky ones to attend your tutorial in Fortitude Valley/New Farm on 15 October.